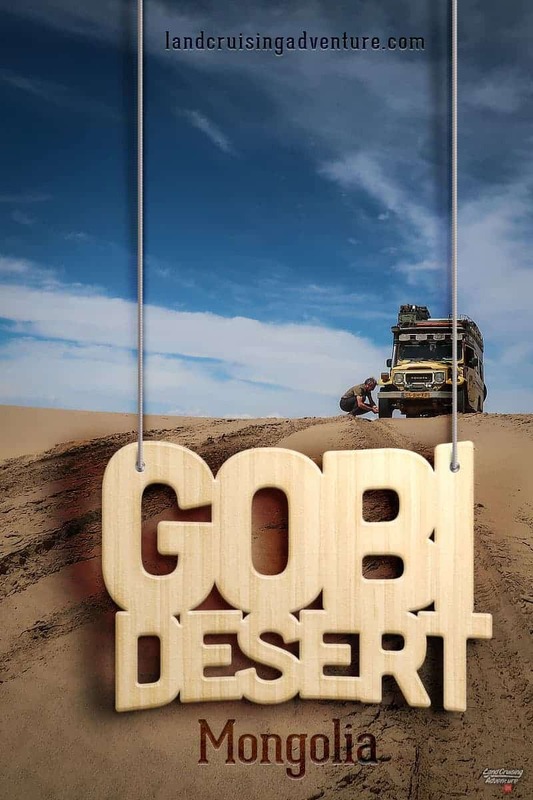 Nothing in our 15 years of overlanding prepared us for Mongolia, let alone the Gobi Desert. The vastness, the emptiness, the distances and the never-ending unpaved roads all have us blown away (sometimes literally). 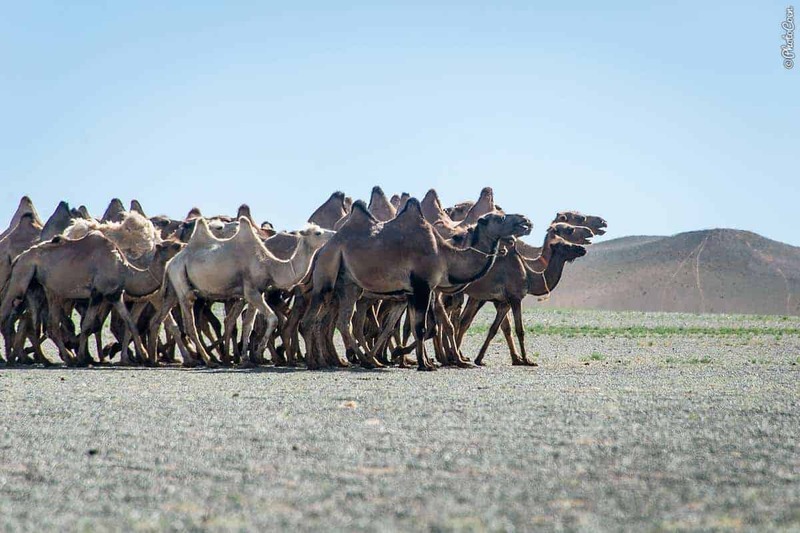 The exhaustion of traveling in Patagonia, Brazil or the few thousand kilometers from Vladivostok to Ulan Ude don’t come close to the travel fatigue that hits us here, in Mongolia. 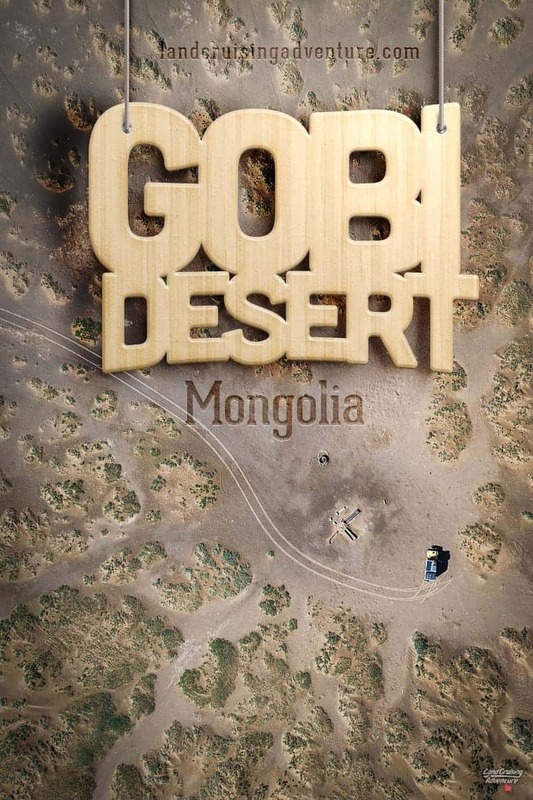 Added to those distances are the Gobi Desert’s dust and ruthless and never-abating wind. 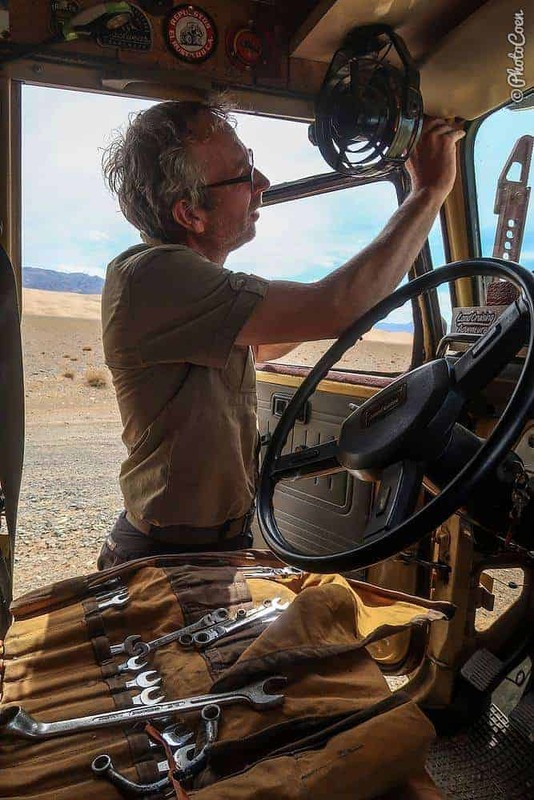 Or combine the two and we’re amidst a serious sand-dust storm with pebbles and camel dung flying against the bodywork while the wind shakes the Land Cruiser like a feather. 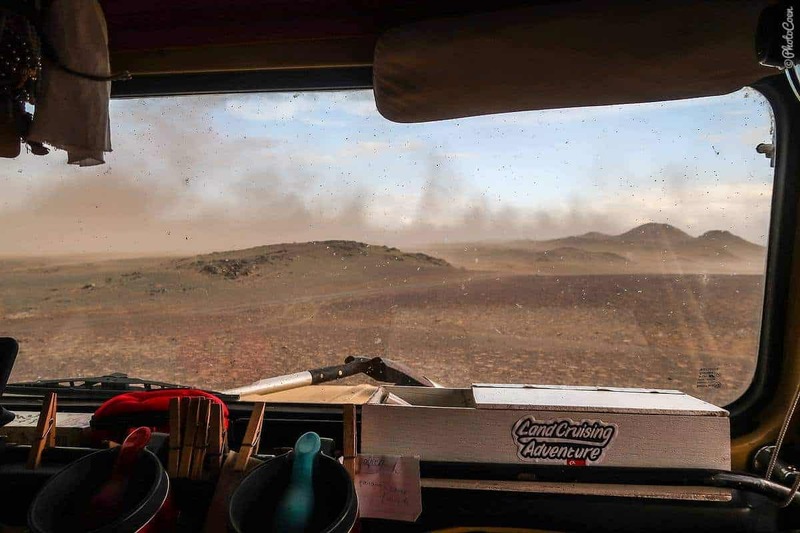 For the past three days we have been driving and rough camping in a continuous dry storm – forget about sleeping in such weather. 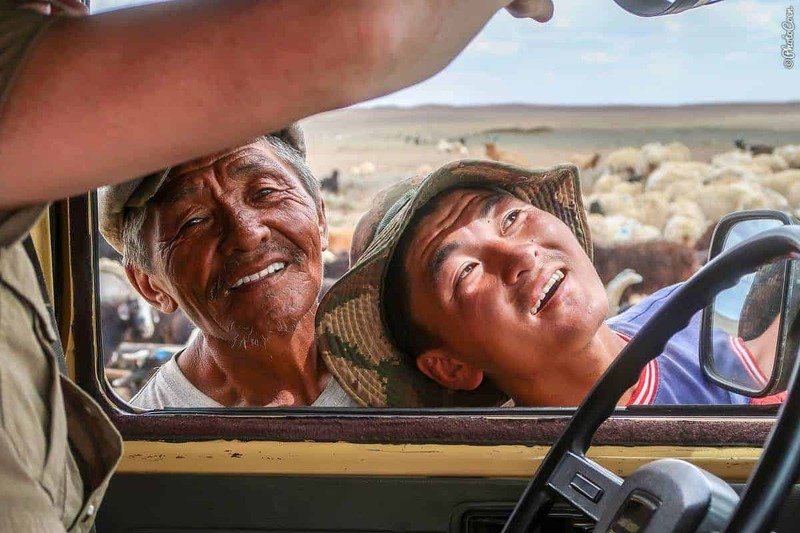 Mongolia is bringing us a fair share of new ‘firsts’! And what a totally different landscape compared to the lush mountains from a weeks ago. 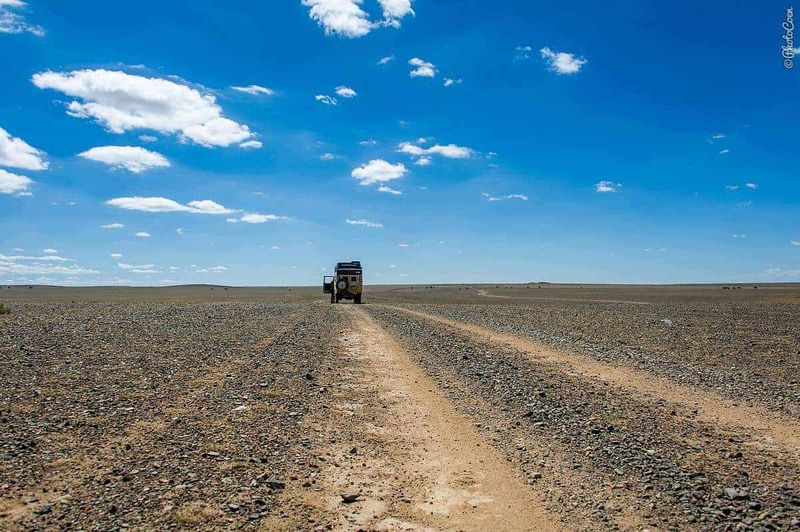 As we meander through the steppe, the mountains and sand dunes, the driving barely goes beyond third gear. Lots of it goes in second. 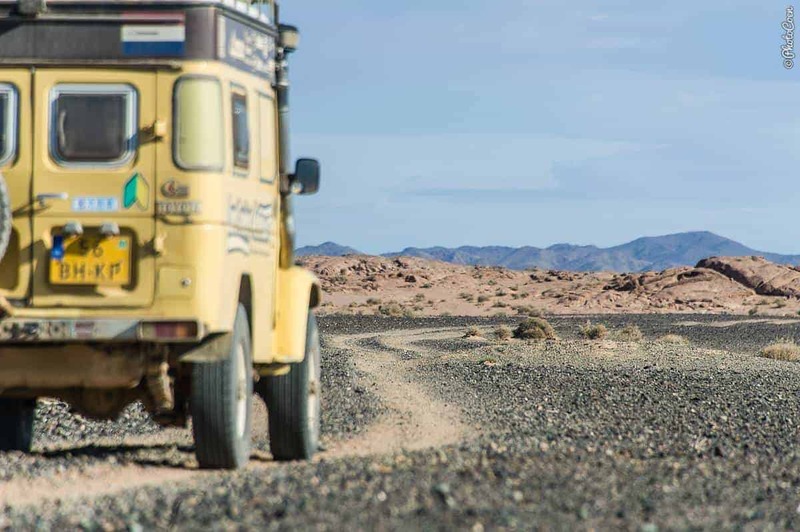 An occasional flat gravel surface without run-offs may get the Land Cruiser into fourth gear. The brakes are tested to the limits and the (snow) tires perform a miraculous job. Bolts break off. Stuff is flying through the car when we hit an unseen pothole when too focused on the obstacles just beyond that point. Without doubt, the Land Cruiser is in for some TLC by the time we get back to the capital of Ulaanbaatar. A short detour doesn’t exist, even though the kilometers aren’t many and on the map the distance is the length of a fingernail. We learn to count an hour, or longer, to cover the twenty or thirty kilometers to see that ruin or rock carving. We quickly adapt in setting priorities in where we want to go – and where not. Vast and spacious as it is, I find the Gobi Desert claustrophobic, contradictory as that may sound. Once in, there is no quick way out. No escape from the sand, the dust and an emptiness that exists nowhere else than in deserts (the Atacama Desert in Chile comes to mind). Shepherds ride iron horses – bright red or green motorcycles. 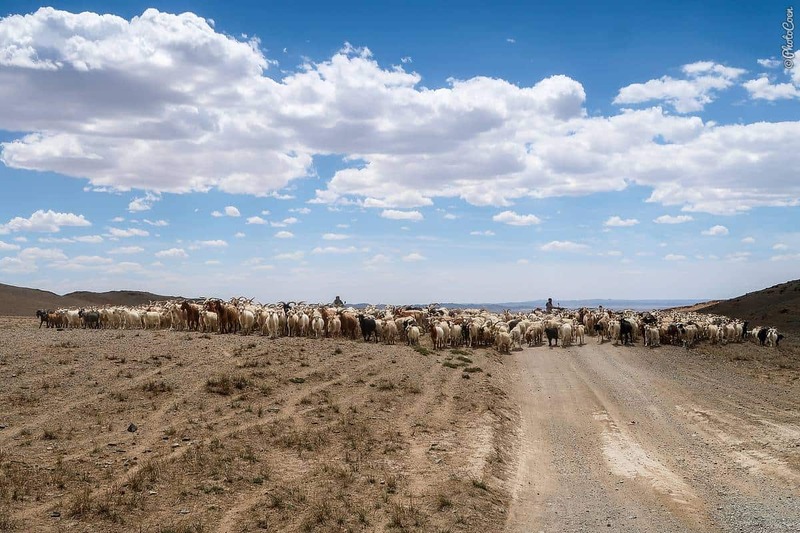 I count only two on horseback during our two weeks in the Gobi. Few people live here. 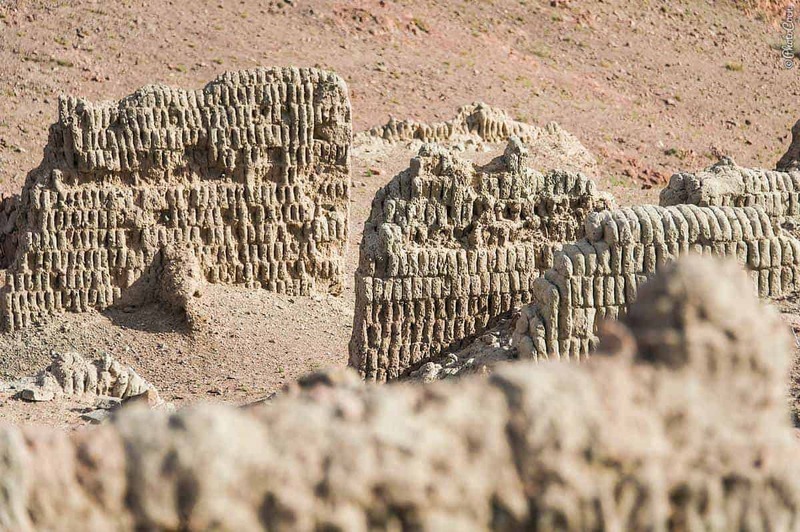 In a handful of villages we see mud-brick or stone-brick houses, but also gers surrounded by wooden fences. In the outdoors, we occasionally see a ger but without the fences. 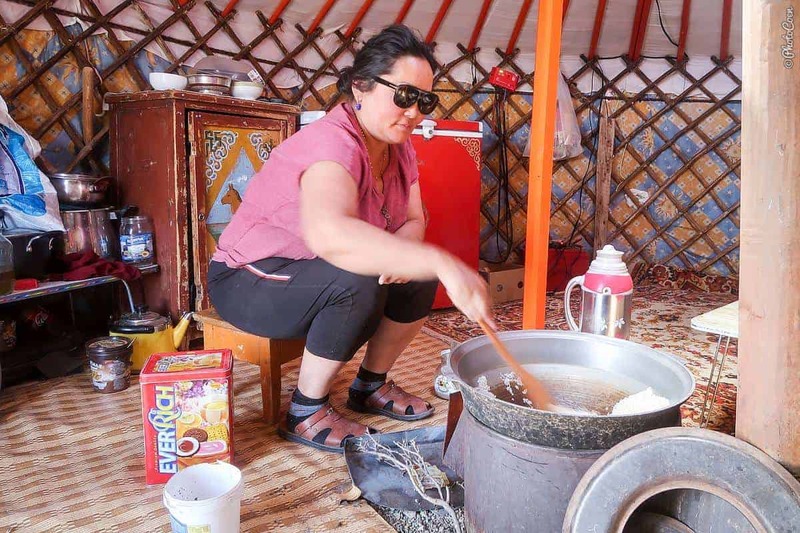 A ger is a Mongolian yurt – a portable, round tent covered with skins or felt and used as a dwelling by nomads. 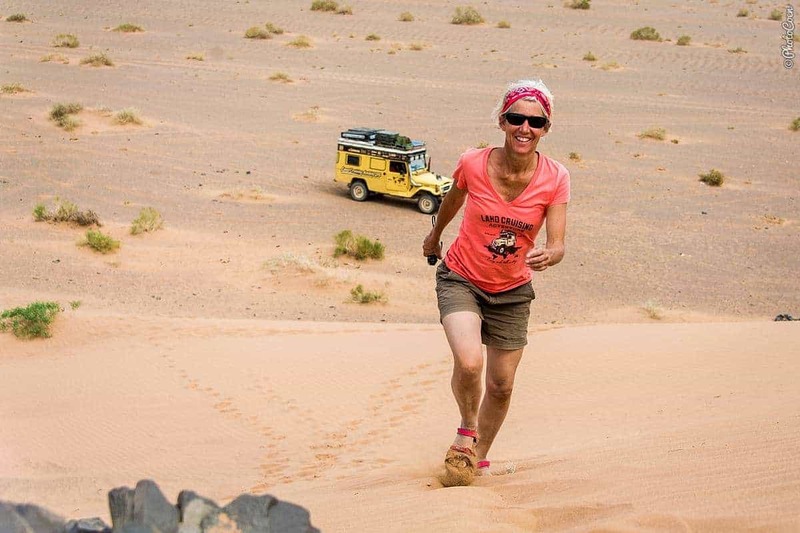 The Gobi Desert may be monotonous, but it is never boring. 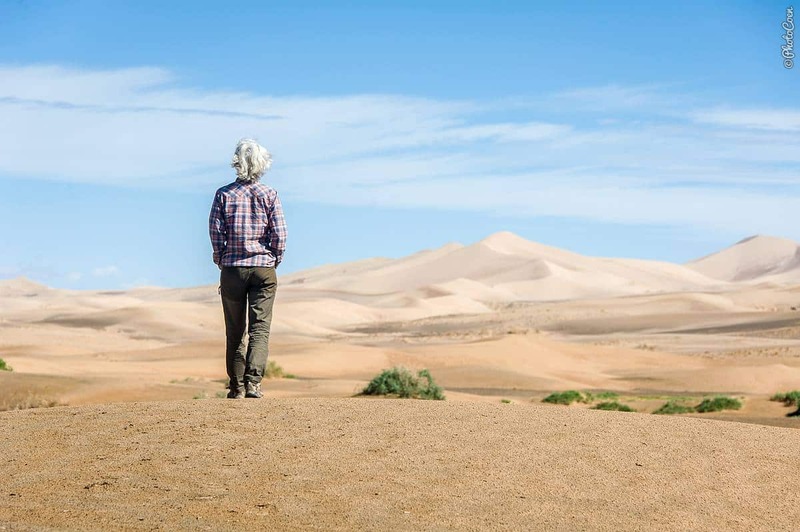 Even though it’s all desert, the landscapes vary enormously and are mind-blowing. In that landscape are treasures. 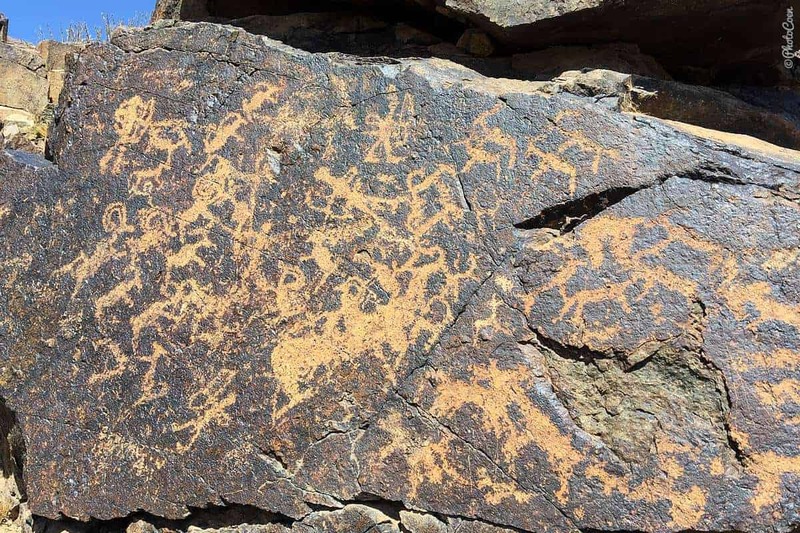 It may take a day or two to get there but then we stroll among the ruins of a destroyed monastery or find amazing petroglyphs deep in a canyon. Or we come across a cluster of super green grass. It runs along an almost dry river but with still enough water to take a bath. Bliss, and we stay an extra day or two. 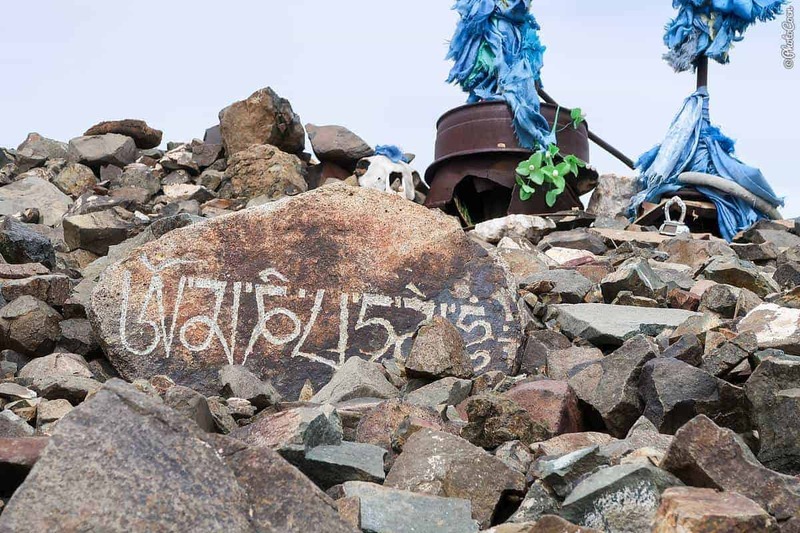 All this is what attracts people to come to Mongolia. No matter what you do or where you go, you will end with a feeling of satisfaction, of having pulled it off. 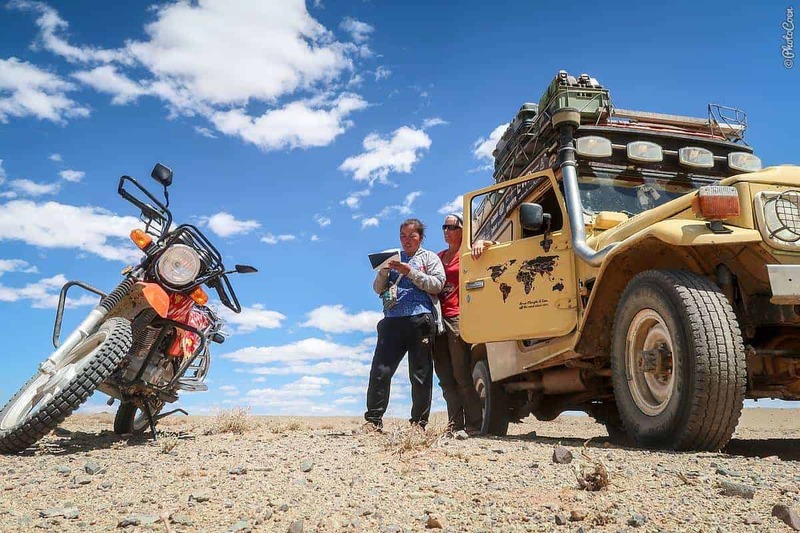 Overlanding in Mongolia is a true adventure. 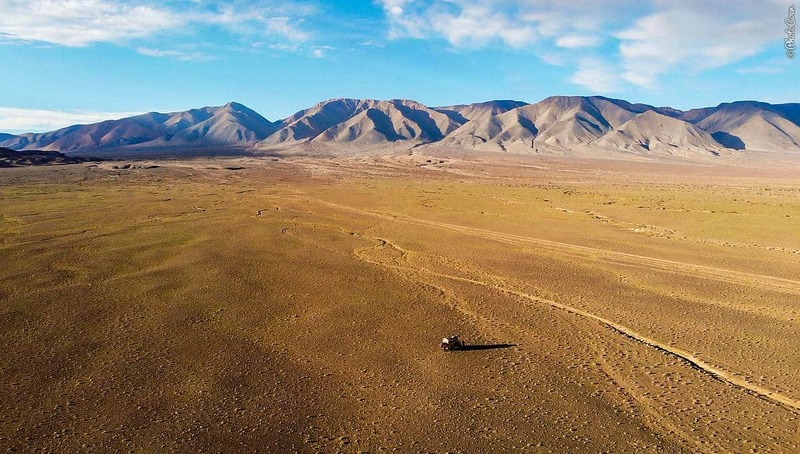 This short drone movie shows how vast and beautiful the Gobi Desert. For more movies, subscribe to our YouTube Channel. To get early access to all movies, join us on Patreon. As little $1 per month helps us to maintain this website. Thanks. 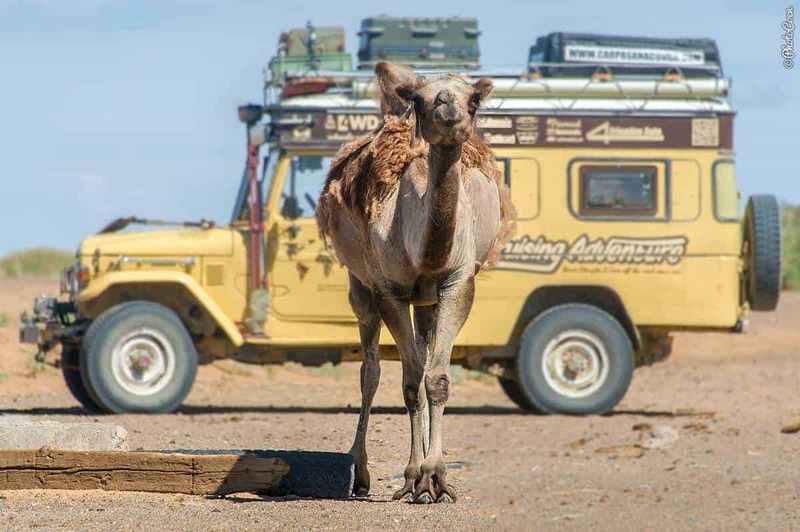 After seeing your photos of the Gobi, I’ll no longer feel like I’m in a remote area when I travel the dirt trails on the plains of Wyoming. The feeling of an remote area also strongly plays with your mind. For all you know there could be a town behind the next bend or hill. But I get your drift. Enjoy Wyoming!